As a child growing up in St. Paul, Father John Ubel recalls confusing the Cathedral of St. Paul with the Minnesota State Capitol. His mother would gently remind him that the cathedral had the green dome, and the Capitol was white. Decades later, he is rector of the cathedral — the dome of which has been restored to dark copper — as it celebrates 100 years since its first Mass in 1915. In an interview, Father Ubel reflected on the building’s history and meaning, and Catholics’ responsibility to it in the next 100 years. The interview has been edited for length and clarity. 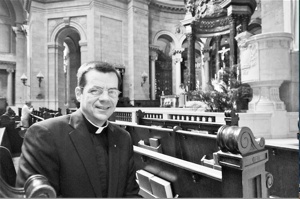 Father John Ubel, in a Catholic Spirit file photo, became rector of the Cathedral of St. Paul in 2012. Q. What does it mean to you to be rector of the Cathedral of St. Paul? A. The people of this archdiocese have given us a sacred trust to care for this beautiful building as a symbol of our local Church. For me, it means to take that sacred trust very seriously and to do all that I am able to preserve this building to provide for the spiritual needs of all the people who come here, whether they are parishioners, or simply coming here for a visit, to be a welcoming presence to all of them. Q. What message do you think the cathedral conveys to Catholics and non-Catholics? Has that message changed over the past century? A. I don’t think it does [say anything different]. In some respects, I’ve also been to our nation’s smallest cathedral, and that’s in Juneau, Alaska, and I’m actually quite clear that when people come to visit, what makes it a cathedral is not its grand size, or shape or anything, but because it is linked with the local bishop. Hopefully, the message isn’t that it draws people just to art and to the building, but to whom that building was built to honor, and that is Christ. If it’s merely seen as a monument, or a work of art, then it’s failed at its core. Q. As you’ve combed through the history, what has grabbed your attention? A. What really draws me in is to think of all the people who have walked into this church, how many people have been baptized, the weddings, the funerals. When all is said and done, this church, God willing, will be here for another 100 years doing the same thing. The fundamental purpose for the building is the worship of God. We honor God through beauty and through art. It took a tremendous sacrifice on the part of people 100 years ago to build this cathedral. Are we willing to make the necessary sacrifices today to preserve it? Q. How are you achieving that goal of historic preservation? A. The Cathedral Heritage Foundation exists as a separate incorporation to preserve the building itself. Some of our donors may not be Catholic, but the iconic nature of the church attracts them. What we need to do first is work on the three rose windows. Even though we have a debt, those probably can’t wait much longer. Q. What is your hope for the centennial celebration? A. I believe very much in what Cicero said: Not to know what happens before one was born is always to remain a child. By East Coast standards, by European standards, we’re young. But 100 years is still 100 years, and I think it’s important for people this year to gain an appreciation for history and for this archdiocese. The Church is comprised not only of those who are here now, but all those who have gone before us. We honor them by preserving the legacy they have left to us.